Operating passenger ships named after Latin American countries and presenting itself as the “Good Neighbor Fleet”, US shipping company Moore-McCormack once had a subsidiary named ‘American Republics Line’. It seems good neighbourship was President F.D. Roosevelt’s initiative taking form from 1936 onwards; in fact the ships were owned by the U.S. Maritime Commission, serving the East coast of South America. There were freight vessels as well I believe. American involvement in WWII led to the ships being used for the transportation of troops; afterwards, Mooremack used its own livery. American Roll-On Roll-Off Carrier (ARC). The logo which appears on the flag contains two flags: a blue-edged white flag with ARC in red centred and the American flag. Seen on their home page at http://www.arrcnet.com which shows the whole of the logo appearing on a white field. One of the nicer house flags: A green field with a large white square bearing a red cross. The green, white, and red colors apparently come from the parent company, Moore & McCormack. American Scantic Line (like many other lines of similar American ------ Line nomenclature) was one of a number of companies set up by the U.S. Shipping Board to revive the merchant marine after World War I. American Scantic was the line serving Scandinavia and the Baltic, an area in which Moore-McCormack Co. was already well established when it bought American Scantic in 1927. It is not clear how long the flag survived; Talbot-Booth records that shown (which matches the description in "The Atlantic Seaway") in 1937, but in 1934 National Geographic had already shown the flag of Moore-McCormack itself as that for the American Scantic Line. Maritime Timetable Images has a piece about 'American Scantic Line Inc.' at http://www.timetableimages.com/maritime/images/asl.htm#asl30c. The brochure on the first picture shows a green flag with a white disk bearing a red letter 'C'. A pity the date of issue is not quite known ("undated; c. 1930"). Conjecture: the 'C' flag was in use between 1926 (or 1927) and 1934 at the latest? American Shipping and Chartering of Houston, Texas (US), founded in 1980, is a maritime firm starting out as a port agency (steel transportation) evolving into a general logistics company with special attention paid to project cargo. Prime destinations are Europe including Russia, the Caribbean, and South America, and the Far East. Homepage: http://www.americanshipping.com/. Shown as a drawing on the site, the house flag is dark blue bearing a white horizontal arrow, wavy and pointed at both ends; the lower line of the left arrow continues to become the upper line of the right one. A sort of broken-up, or dispersed, double arrow. Luckily the white version of said house flag appears in the image carrousel to provide a better view of this striking logo. Although there is not even a table flag picture to grace this message, we should nevertheless record the item. Ideally, of course, each and every firm using a flag logo without there being proof of its actually being used in the cloth should be contacted for information. One of the house flags on the Kennedy, Hunter & Co. sheet is that of the American Star Line, New York. Traces are found on the ‘net concerning ships bought in 1918 and 1921, plus a 1926 court case. Then there is a gap till we get to the ‘eighties. See a Federal Maritime Commission ruling, 1990 reachable via http://www.fmc.gov, i.e. “American Star Line, Inc. National Transatlantic Lines of Greece S.A., and Dimitri Amminos - Possible Violations of Passenger Vessel Certification Requirements - Initial Decision” where we learn that Mr Dimitri Amminos was President of both American Star Line (incorporated Delaware, 1986) and the National Maritime Line of Greece S.A. (inc. Panama, 1986), later named National Transatlantic Line of Greece, firms which were to operate and market cruises on a passenger vessel to be named the ‘Betsy Ross’ with a capacity of more than 300. ASL represented NT, which also used ASL as a trade name. Both advertised cruises in 1987 but none were forthcoming. At last the ship – at least that one existed – was chartered to Star Lauro in 1989. My somewhat shaky conclusions: there must have been two American Star Lines…And supposing – with some reason - Kennedy, Hunter & Co. to have been agent to the modern one, its house flag was white, bearing a horizontal middle stripe divided, again horizontally, red-white-blue; and a large white star over all. The star is rendered visible using black holding lines and it slightly encroaches upon the upper and lower white stripes. The American Steamship Company, known as the American Line, was established by the Pennsylvania Railroad in 1873 to attract traffic to Philadelphia away from the New York terminals of its archrival, the New York Central Railroad. It operated under several different ownerships until about 1925. 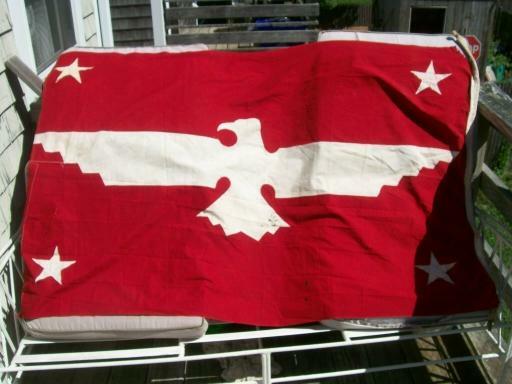 First Flag (1873-84) A red burgee with a white keystone, which was the trademark of the railroad. It derives in turn from Pennsylvania's nickname as the "Keystone State" and is a widely used symbol of the state. A red star was added to the keystone after the company was sold to the Red Star Line, the Belgian-flag subsidiary of the US holding company International Navigation. An 1880s poster advertising American Line service from Philadelphia to Liverpool shows this same flag with a blue field. Finally, the blue eagle on white was adopted when the Red Star Line passed into the ownership of J. P. Morgan's International Mercantile Marine. 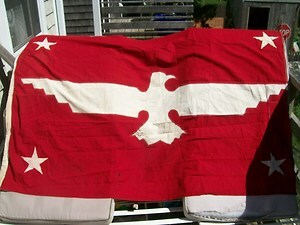 The IMM revived this flag for the United States Lines when it acquired that company in 1931. The house flag of this firm (not to be confused with the ‘American Line’) is the last one on the second row, here, and an enlargement here. It is a white, blue-bordered swallowtail bearing a red ‘A’ (no serifs) near the hoist. its classic freighters in the next decade, keeping the self-unloading ships. It was bought up again, this time by GATX Corp. (leasing and financial services) in 1973. During the eighties, the steel decline resulted in ships being sold off to cut losses. But the next decade saw an expansion of operations towards the Gulf of Mexico. In 2002 American Steamship and Oglebay Norton Marine Services pooled their fleets under the name United Shipping Alliance. A red-bordered blue swallowtail with a white A. No other information on the company. According to Talbot-Booth (1936) the company was formed in 1928 and also used a pennant version which is probably that given for America-West Africa Line by Brown 1929. This version of Brown had A.H. Bull & Co. Inc. as operators and the format is similar to their flags. By Brown 1934 the plain swallow-tailed version is shown under the American West Africa Line title with the company now being operated by Barber Steamship Lines Ltd. After WW2 the trail is cold. In 1910, a group in Baltimore formed the American Oil Company, which came under the partial ownership of Standard (Indiana) in 1923. However, the new owners did not require Amoco (as it was called for short) to give up its existing identity, and in 1932 Amoco adopted a red, white, and black oval with the word "Amoco" across the center as its trademark. Standard adopted a combination of American's oval and its own torch as a logo in 1946, but American continued using the logo without the torch until 1960. In that year, all assets of Standard (Indiana) were transferred to American and the company officially became Amoco. British Petroleum recently bought out Amoco and has indicated its intention to end Amoco's separate identity, and the torch and oval emblem, within the next few years. Formed by the US Maritime Commission in 1938 to head off the impending bankruptcy of the Dollar Line, the leading carrier between the US west coast and Asia. The flag, red with a white eagle and a white star in each corner, was intended to continue the use of the Dollar Line's red and white colors while evoking the US Presidential flag, which at the time was blue with an eagle and four white stars. The unusually long proportions are as shown on the APL website. American President Lines officially changed its name to APL, Inc., several years ago and is now a subsidiary of NOL (formerly Neptune Orient Lines) of Singapore. The company flag adopted its contemporary design in 1938, upon name change name from Dollar Steamship Lines, and the chosen design was inspired by the US presidential flag. This article is available on line in full-color facsimile at http://content.cdlib.org/ark:/13030/tf000000tf. The usage dates we know for this flag (red with eagle and stars) is therefore 1938-1980.
http://www.ebay.com/sch/sis.html?_nkw=AMERICAN%20PRESIDENT%20LINES%20APL%20vintage%20glass%20ashtray%20&_itemId=120740144614 may still bring it up] on E-Bay and it struck me that the eagle was facing the fly instead of the hoist (attached as us~apl38o.jpg ). There did appear to be a sleeve on the viewers left but there were some further photos including one which is definitely the reverse as the sleeve can be made out and this confirms the eagle is facing the fly too. But all other showings of the flag/logos etc have the eagle facing the hoist so the question is, was this an incorrect manufacture or was there a period when the eagle looked the other way. In case the link stops working I enclose two images in support. APL, Inc. (formerly American President Lines) shows a large eagle-bearing flag (aquilaferous – ha!) which once appeared on eBay is attached as the image above (reduced). Source: German eBay, offer no. 130305128176 (end 15 May 2009) put up by “glashaus6”, dimensions given as 1,20 m x 2,00 m .
No doubt reflecting the present situation, its field is white bearing the red stylized eagle above fat dark blue initials “APL” (no serifs) but more importantly, horizontal stripes are added to the top: a dark blue one sustained by a narrow green one, the first bears the name “NOL GROUP” near the hoist in white letters (italic, it seems). So the Japan based MOL (Mitsui O.S.K. Lines) Group is now involved with APL: both together with Hyundai formed The New World Alliance in 1998, joining forces to expand their maritime container traffic: http://www.naukri.com/gpw/mol/services.htm. 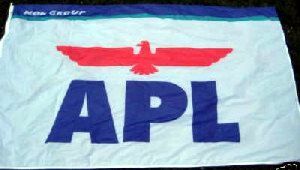 The flag shown by Jan from EBay, showing "NOL" at the top, standing for Neptune Orient Lines Ltd. of Singapore who acquired American President Lines Ltd. in 1997 renaming it APL Ltd. and continuing to use the eagle trademark. The current APL logo as seen at http://www.apl.com is the eagle in red over APL in blue as per the flag. The use of red eagle dates from c.1955. Company founded during the Civil War but did not begin operations until hostilities were over; an effort to draw some of the trans-Atlantic traffic away from New York and restore Boston's stature as a major center of the oceanic trade. It didn't work; the firm was undercapitalized and ran out of money before it even got a second ship into operation. House flag was a white pennant with a red border and the company initials in red. No information except the flag: divided diagonally white over red, with red and blue upper and lower edges and the letters A in blue and T in white on the two halves of the field. Involved in the tanker trade being shown with 1 vessel, "American Trader" at 1939, being sunk 1940. Continued in business but from the early 1970s is shown as American Trading Transportation Co. Inc., ceasing operations in the early 1990s. Sources vary as to the width of the red and blue bands at top and bottom and Brown 1951 deletes them entirely. No information except the flag, blue with red upper and lower edges and the initials AUT.